CRAFT CFD® was used to assess a noise reduction concept for a hot supersonic jet. Chevrons are mechanical devices installed on jet nozzles to enhance mixing and modify noise emissions. For this analysis, computation of the flow field was performed using Large Eddy Simulation (LES). The flow solution is then transformed to far-field noise using the Ffowcs Williams – Hawkings (FW-H) equation for noise prediction. Instantaneous Mach number contours from the LES results show that there is substantial penetration of entrained flow through the valley of the chevrons. The results also show that chevrons stabilize shock cells and reduce flapping. Results from the far-field noise analysis show that chevrons reduce 3-4 OASPL dB in downstream direction, 1-2 upstream. Traditional jet screech tone (~4.55 kHz, St~0.29) is eliminated with chevrons. Furthermore, broadband noise is reduced in the entire downstream direction. 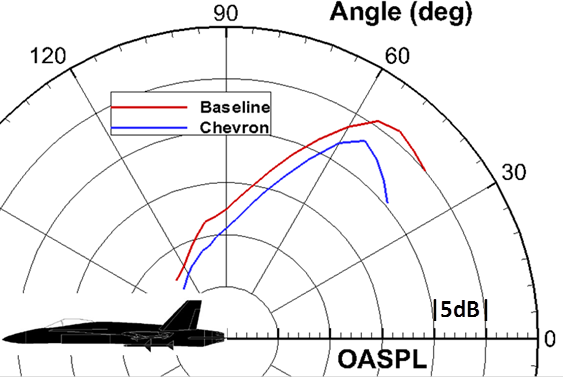 Overall Sound Pressure Level (OASPL) plotted 100D(jet) downstream and in circular arc array centered about nozzle exit.